With the warmer weather, salads are just the perfect choice – quick and easy to make and just nutritious! 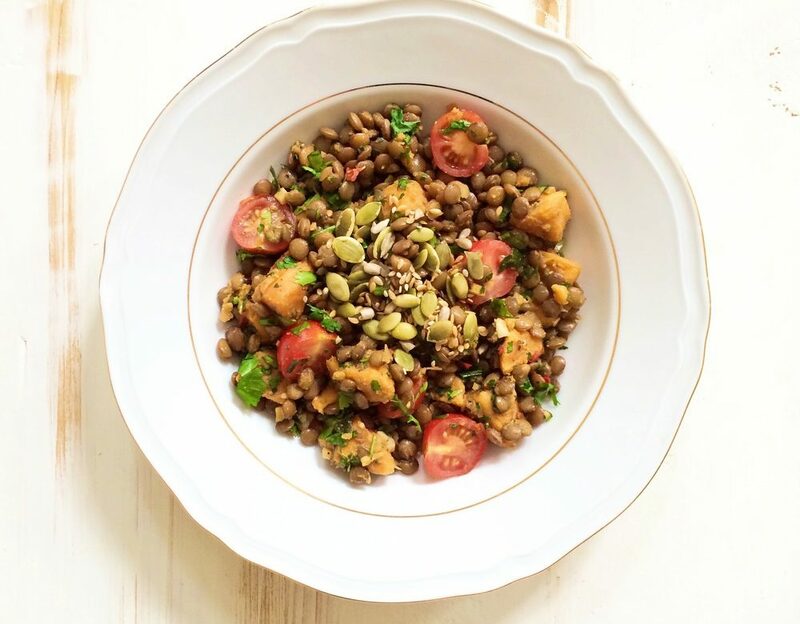 My sister and I recently prepared this delicious lentil & sweet potato salad, which is one of my favourites. I love lentils and it helps that they are a good source of protein. If using lentils that you have soaked overnight place in a pan of water and bouillon powder on low heat and cook for 30 minutes. Once cooked you can sautee them. If you are using tinned lentils you can place them directly in the pan with the olive oil, garlic, spring onion, ginger and parsley. Add two tablespoons of water and sautee’ for 2-3 minutes. Once ready set to the side and allow to cool. Once cooled you can add the sweet potato cut into small pieces, cherry tomatoes, coriander and mixed seeds. You can eat this salad warm or cold. Add olive oil and tamari as a dressing and enjoy!